The New England Patriots face the Cleveland Browns on Sunday in Foxboro, MA. The Browns are coming into the game fortunate to have starting quarterback Jason Campbell cleared to play after missing time and being replaced by turnover prone Brandon Weeden (who is also suffering from concussion symptoms and not able to go on Sunday). The Patriots won last week on the road in Houston against the Texans, but it was a difficult game for the visitors as the Patriots eventually won the game in the fourth quarter. The Patriots had to comeback from another halftime deficit before tying and then winning the game on a pair of 53 yard field goals from kicker Stephen Gostkowski. The Patriots defense has a difficult assignment on Sunday trying to contain Cleveland wide receiver Josh Gordon. Gordon has been fantastic since returning from a two game suspension at the beginning of the season. 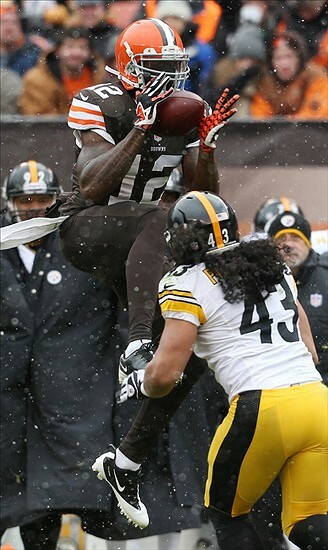 No matter who is the quarterback so far this year in Cleveland, Gordon has excelled. In fact, over the past two weeks he was record-setting: Gordon hauled in 24 receptions on 31 targets for 498 yards and 3 touchdowns against Pittsburgh and Jacksonville. For the Cleveland Browns their entire offensive gameplan the past two weeks has seemingly been to throw the ball to Josh Gordon. With 24 completions and almost 500 yards over the past two games, Gordon has been simply amazing. With the New England secondary banged up, there is much speculation by the national media that Gordon could make it three straight games going over 200 yards receiving.